Post by Greener Pastures – a No Doubt fan site. Hello! 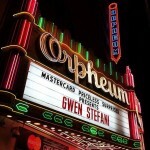 Gwen’s MasterCard Priceless Surprises concert was last night, and it looks like it was amazing! It took place at the Orpheum Theatre in Los Angeles, California. The show is receiving glowing reviews, such as this one from the Hollywood Reporter! Many more can be found on the Getty Images web site. Some attendees have also posted great photos to Instagram, such as Marinxd, and elskanminn. Don’t forget that Gwen will be performing with Adam Levine on the Grammy Awards tonight! Hello! Check out this article about Tom, posted today on the Long Beach Post web site! Editor’s note: The following is the second part in an ongoing series on notable Long Beach residents. For Tom Dumont, life in Long Beach is “Rock Steady,” to quote lyrics from his world-famous rock/pop group No Doubt. Back in the 90s, Dumont and his three bandmates, Gwen Stefani, Tony Kanal and Adrian Young, skyrocketed to fame when the band put out chart-topping hits like “Just A Girl,” “Don’t Speak” and “Spiderwebs.” To date, the band has sold more than 33 million albums worldwide, and has released six studio albums since the early 1990s. When the group first started, they would travel all over the world, and when Dumont, the guitarist, would return to his then-home in Naples, which he shared with Young, the two would frequent Second Street to relax and have fun. Things changed, however, when the band members entered adulthood and became parents in the 2000s, said Dumont, a father of three children, in an interview with the Long Beach Post at Aroma Di Roma in Belmont Shore. 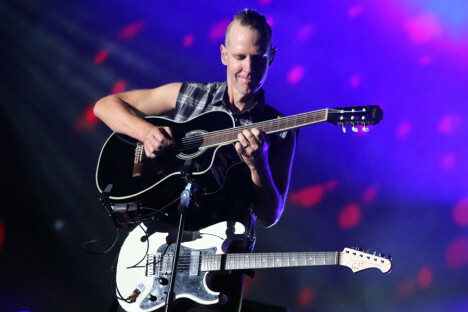 Though touring with No Doubt has allowed him to see the world, Dumont said he couldn’t see himself calling any other place but Long Beach home—even Orange County, where he grew up. No Doubt still plays shows, he said, but they’re not as frequent as they used to be. He noted upcoming appearances at festivals in Las Vegas, Napa and New Orleans. Having a family has also made touring more difficult in general, Dumont said, adding that there are 12 children among the band members. But he’s taken his experience with the band and put it toward his parenting. Dumont said his time off from touring has given him a chance to get to know his city and develop a passion for it. He said he has also recently become particularly interested in local politics. He first got interested in local politics in Long Beach when now-Mayor Robert Garcia first launched his campaign. Dumont was so inspired that he decided to lend his musical talents to Garcia’s mayoral run in the form of a campaign video for YouTube, for which Dumont wrote the music. Elected officials like Garcia and Third District Councilmember Suzie Price are bringing a fresh perspective to Long Beach politics that opens the door for creativity and modernism, Dumont said. Dumont, a surfer, said the breakwater is a concern in his book, but he thinks the city is taking the right approach to studying it. While No Doubt has been on hiatus from touring since 2009, besides a few scattered shows throughout the years, Dumont said he’s been staying busy with a new endeavor: technology. He said he has been working with a local Long Beach group to develop an app called Volleypay, which he hopes will be out by late spring. Looking back, Dumont said he misses the old lifestyle No Doubt provided for him, but he’s also excited about his current endeavors. Hello! 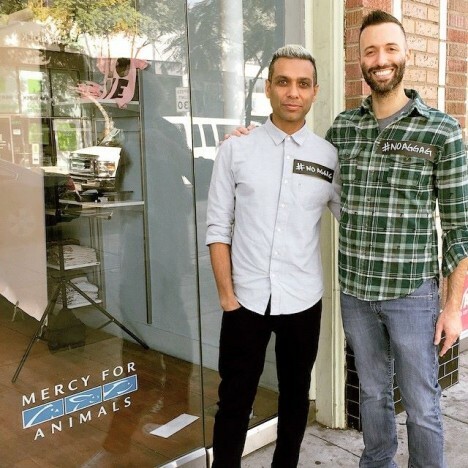 Tony posted to social media sites yesterday in support of Mercy For Animals’ #NoAgGag campaign. Thanks to Fashion Scans Remastered for sharing some high-quality scans of the magazine! Hello! Gwen was on the Tonight show last night, and she was interviewed, and also performed a song medley! You are currently browsing the Greener Pastures – a No Doubt fan site archives for February, 2015.